Sushi, sushi, sushi. Oh my, if I had it my way…I would eat sushi rolls all day every day. I mean, *technically* speaking I could eat sushi every day BUT there would just be two minor (huge) issues with that. I would be dirt poor. I wouldn’t be able to fit through the door. I’m not sure that I totally believe the old saying “you are what you eat” but I’m 99.9% sure I’d rather not have to [roll] myself everywhere. So…I’d rather play it safe than sorry. Now, don’t get me wrong. Compared to many other restaurant food options out there, sushi is preeetty darn healthy. But with everything, it’s definitely best if eaten in moderation. I think that the most common misconception about sushi is that it’s basically composed of fish and vegetables so 3 or maybe 30 (my lack of self control is a joke) rolls won’t do much harm. Hooooowever…all of those healthy ingredients are nicely wrapped in a thick blanket of rice. Boy those sneaky carbs’ll getcha. Of course, there’s always the option to substitute that rice for cauliflower – which works tremendously like in my Low Carb Spicy Shrimp Sushi Bowls recipe. BUT, eliminating the need for a rice-like ingredient at all works like a charm also. The ingredients in these California Roll Low Carb Sushi Stacks are wedged between two slices of cucumber. Juicy, crunchy, refreshing feels in every bite. Another ingredient that I absolutely adore for all of my healthy substitution needs is Greek yogurt. Literally, you can throw this magical ingredient into so many recipes and voila, you saved yourself some major Cals my friend. For this recipe, we’re making a lighter version of spicy mayo with just two simple ingredients – Greek yogurt and Sriracha. 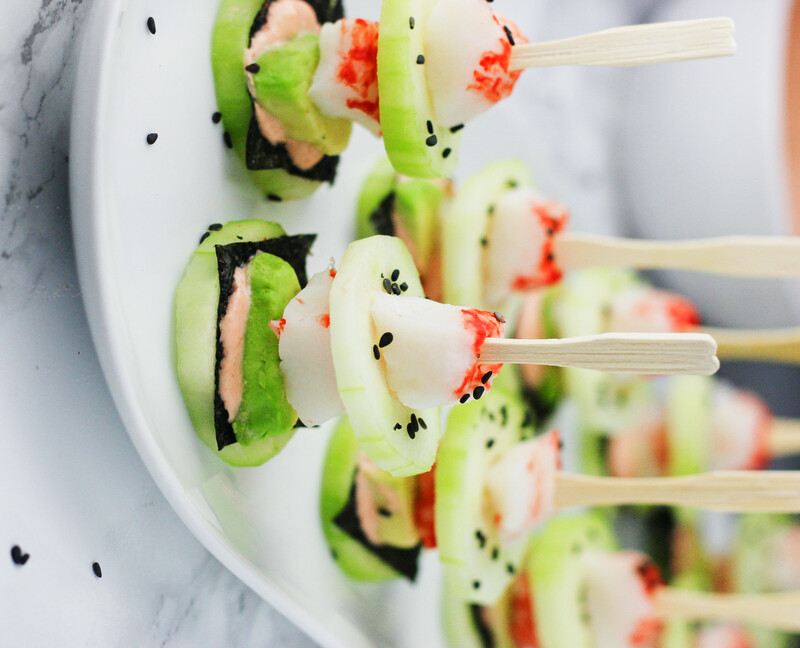 It adds the perfect cool, yet spicy kick to these sushi bites. Another thing that I love about making these low carb sushi stacks is the fact that you don’t have to take a crash course in sushi rolling. If you’ve never attempted to make sushi rolls from scratch that can actually be picked up with chopsticks and transferred from plate to mouth without falling apart into a sad mess, word of advice: don’t. Or at least don’t wait to give it your first shot 30 minutes before an event where you’re planning on dazzling your guests. Those sushi chefs make it look annoyingly easy. Peel cucumber and cut into 20 slices, each around 1/4 inch thick. Arrange 10 of the cucumber slices on a flat surface. Cut sheet of sushi nori into individual approx 1.5" x 1.5" squares. Place a square on each slice of cucumber. In a small bowl, combine the Greek yogurt and Sriracha. Add a small amount to each of the 10 slices with the sushi nori. Set remaining sauce aside for dipping. Slice avocado into 10 individual pieces and lay one piece on each of the 10 cucumber slices. Top with a chunk of crab meat and another slice of cucumber. Finish with one more piece of crab meat and use a cocktail pick to hold the sushi stack together. Garnish with black sesame seeds (optional) and serve with dipping sauce. For a spicier sauce, feel free to increase the amount of Sriracha. Oh my this looks so yummy, beautiful picture. What beautiful pictures! I can almost taste them. Yum. When I go out for sushi I always ask for it wrapped in cucumber instead of rice. This is an awesome do-it-at-home version of that! I love it, thanks for sharing! It's definitely a great idea to opt for cucumber if you're anything like me and can't stop at just 2 rolls 😉 Thanks for stopping by, Halley! omg so yummy! I also just love all your pics. The lighting is always so bright + clean!